I saw it on the wall of my grandfather's house in old photos, and it hung above the green couch in our living room from the minute my parents moved in. It came along when I left, and is still the last thing I see when I walk out the front door. Scalloped edges aren't my taste, although were probably in style when the mirror was made sometime at the beginning of the last century. But everywhere I've lived there's always one wall where it fits perfectly, and looks stylishly retro rather than old-fashioned. 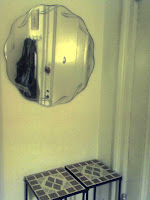 For many years my mother refused to buy a full-length mirror, which I think she considered a frivolous luxury. Besides, you could see the key parts of yourself just fine in front of the big round one. But for a better assessment of how my shoes looked with my pants, an important consideration as a teenager, I had to stand on the green couch and jump up and down until my ankles came into view. The mirror watched me grow from 6 lbs., 12 oz. to an adult, leave for school and crawl back, make some really big mistakes, fix them, pack, punch a door, laugh, cry, wonder, sigh with relief, tiptoe in confusion, doubt, tenderness. I think it did the same for my mother and grandmother before me. It keeps every secret, and always smiles back. I wonder where it will say hello and goodbye when I can't take it with me anymore.